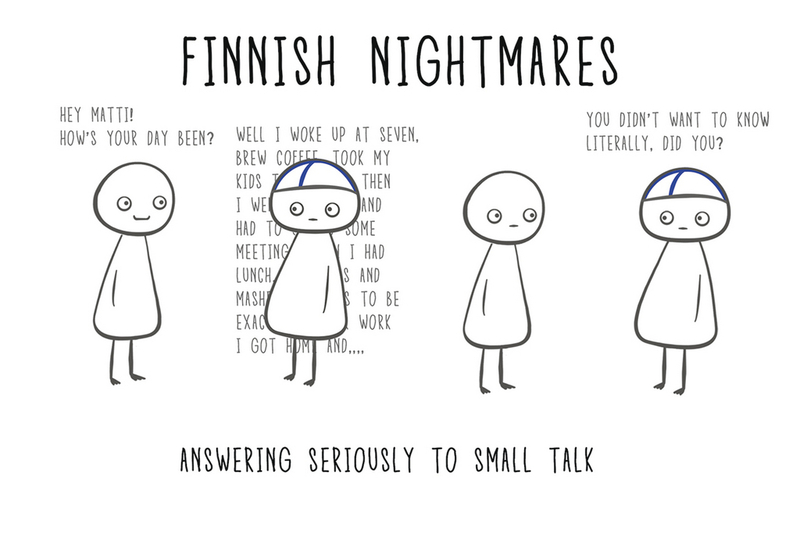 I have many things that I identify with Finns and Finland. As I have lived abroad by myself before, I think they are easier for me to recognize that maybe to someone else who has not been living abroad before. One of these things is the some of the really basic characteristics of Finn’s personality. I find it really interesting how everything is so well in Finland (generally speaking and as well as when comparing to other countries) but still, there is always something to be unsatisfied with. I think it is a funny way of thinking but really common to many Finns, and I think for people abroad it is something really hard to understand. I also fall into this “Finnish” personality type as well. For example, when someone asks me how I am doing, the most common answer is “okay”. If I would say “I’m good” or even “I’m excellent” it would feel like I would be exaggerating. Also the traditional foods we eat in Finland I find really dear and Finnish as well. For example makaronilaatikko, karjalanpiirakat and korvapuusti. These are some of the foods I was used to eating in Finland, but when I moved to the USA where there was not a chance of getting these foods so that they would taste the same as back home. Even though I got used to living without these foods, I don’t think there’s anything that could overrule these foods. The thing I feel is the most Finnish thing is the sauna. That is the thing I feel I have always missed the most when I have been traveling or living in different places. Even though there have been “saunas” but where people have sat with their workout clothes on while using their smartphones. Also throwing water into the stones has been prohibited in every foreign sauna where I have been, so usually the saunas have not been as warm as I have hoped they would be.